» Paddling permit bill still alive? Paddling permit bill still alive? Under HB 2320 you would need a permit to use a nonmotorized boat like this on the Willamette and other Oregon waters. I didn’t think the canoe permit bill would get very far in the 2017 Oregon legislature, but Rep. Knute Buehler has just launched a petition against it on Facebook, so maybe this attempt at regulatory overreach is still alive. 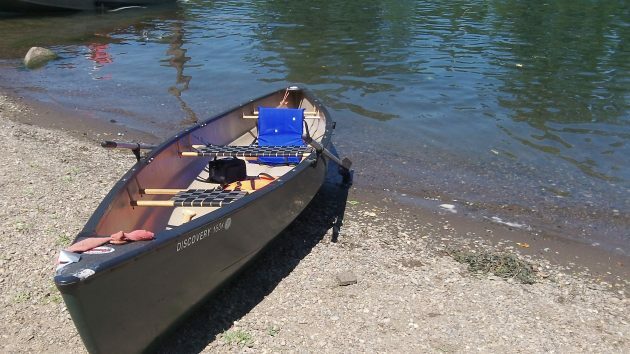 House Bill 2320 would launch an Oregon program to require a state permit and payment of a fee to paddle on our rivers and lakes in nonmotorized boats such as kayaks and canoes. I wrote about in January. As proposed in the bill, the fees would be $4 for a week, $12 for a year, or $20 for two years. The Oregon Marine Board guesses the money might amount to a million dollars in a two-year budget period. The bill also demands that people wear life jackets when riding on float toys such as inner tubes or air mattresses. “Where does it end?” asks Buehler in a Facebook posting that invites people to sign his petition against the bill. He’s a surgeon and a Republican representative from Bend. The House Committee on Transportation Policy held a hearing on HB 2320 on March 1 without acting on it, and as of Monday the committee’s calendar showed no further meetings on the issue. So maybe the members recognize that requiring a permit for the simple pleasure of paddling a canoe down our rivers does indeed go too far. After paying licensing fees for two boats that I barely use, invasive species tags for them and a rarely used canoe, and $99 for the privilege of fishing occasionally, I do feel well taxed. I have seen brown people in canoes. RE: Hartman – wait, what? Not talking about motorized boats regarding a bill targeting non-motorized boats isn’t angst or admission to approval of taxing motorized boats. That’s like saying you didn’t mention passenger ferries in your post so you’re bias to them. Or why didn’t you talk about train bridge crossings over roads, that must mean you have a secret agenda for the railroad companies!! Seriously though, I don’t want mandatory lifejackets for when I’m tubing along the Alsea River, which is maybe waist deep in the places I like to float. Also, we have penalties in place for people that litter, regardless of where they are at or what they are doing. Or are you saying that paying a $4 fee gives people carte blanche to toss trash into our waterways because that money will be used to pay others to clean it up? That sounds worse! As OR strives to emulate CA, more and more simple activities of life will have to be taxed and regulated. Government intrusion into our lives will only end when liberal progressives are chucked out of office for sensible governance. How about a tax on bicycles, say $25 per year for bike lanes. And how about making the city council financially responsible for stupid decisions like the merry go round. I give it 3 years after opening to be totally defunct. I agree Kellum. It is a money grab but this is the least of our concerns. But no roof tax. Look, this is next! Higher income taxes because “we” voted to let out of state corporations off the hook. Why? Out of fear we would pay more for said services. Well guess what! We will PAY one way or another and the Corporations will laugh all the way to Wall Street. I’m “sorry” HH doesn’t report on this. Ha ha. Not my idea. Far from it! Go to the Oh’s site or click the link. We should be taxing the corps. more not the We the People more. Should be banned from future contributions.